1 small cylinder vase 6"H x 2 3/8"Diam. This is a winter arrangement with its white, green and red colors. It is streamlined, simple, and elegant. The cylindrical small glass vase and simple oval large glass vase are modern in appearance. You can buy an oval vase like this (click here) The flower stems form a "V" that anchors the arrangement and takes the eye up. At the same time, to counter-balance the movement of the eye vertically, the main vase is subtly divided into 3 horizontal sections; the line of the marbles, the water line and the top of the vase. These 3 sections are almost equal, following the Greek rule of the "Golden Mean," the ratio of 1/3 to 2/3rds, with the water and marbles making up the 2/3rds, and the top of the vase making up the 1/3. These large white roses are stunning. You will be wiring them so that their heads don't droop, and you will have to guide the stems down as you place them to keep the geometry in the arrangement. The kale adds structure and a fullness to the top of the arrangement, punctuated by the little red coffee beans. Are you ready? It will be fun making this impressive arrangement. Cut a snip off end of all stems and keep in water until used. Carefully place bag of clear marbles in vase. Fill with water. Fill to about 2.5" from the top. Insert 1//3 wire vertically into calyx or "seed box". Wrap wire down the stem. Measure center rose at 17.5 inches. Cut and put in vase. Measure and cut next two. They should be 1 inch lower. Measure and cut 4th stem 1" lower than the last 2. Using the same center stem, repeat this in the back. Add 2 roses a little lower than center rose to each side of center rose. Trim kale stem and put on angle on each side. Make a V. It should look like this. Pull off any leaves that will be below the water. Trim coffee bean stems and add to sides. Fill in with rest of roses (save 2.) Keep shape slightly rounded. When you've added all roses, shape should look like this. Measure coffee bean stem to position off right side and cut. Hold back kale with one hand. Add coffee beans to front left side, angling down to center. Add coffee beans to back, angling down toward center. Fill lower 1/3 small cylinder with marbles. 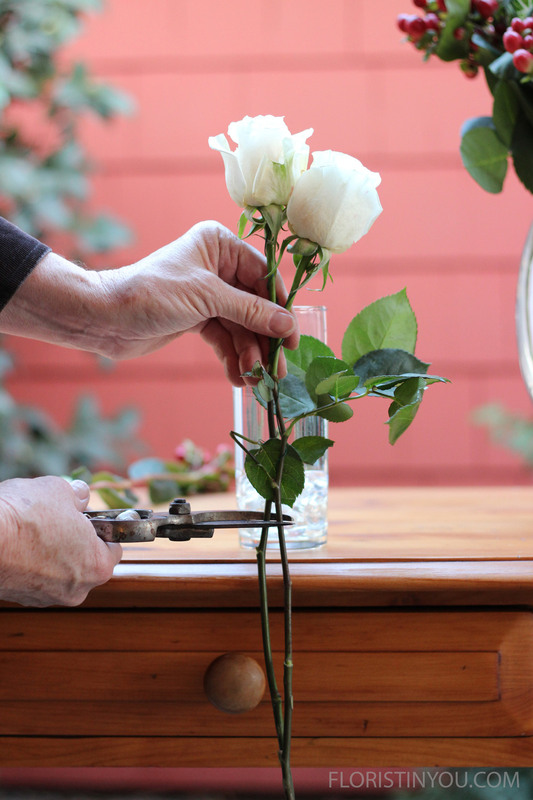 Measure and cut 2 roses. Measure the coffee beans and cut. Add them to the cylinder. You've made a gorgeous winter arrangement, and if you're dressing a table, a smaller complimentary vase.